middlearthknitter: When life makes you glum, hope the postman cheers you up! When life makes you glum, hope the postman cheers you up! Club yarns are being posted off this week, after that the clubs will take a lil break and return I am thinking in February to allow me to decompress after the holidays and get bak into the swing of it all again. Its almost like the postie knew I was glum though as I have recieved two lovely parcels, both etsy buys and both rather special! First up is a very very special stitch marker bought from the lovely Aija of Sock Pron and zero marker fame! 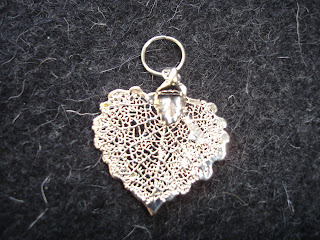 This is so pretty and unusual, its a skeleton leaf dipped in silver, it is very striking and I am amazed at how sturdy this pretty little thing is. I will use it as a marker for now but I also think that I will look for a fastening to make it into a pin or shawl pin, suggestions and ideas for this most welcome. 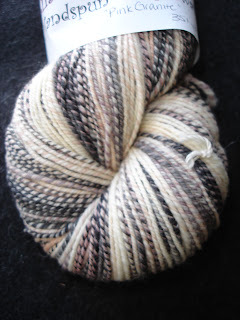 next up is something very new to me, I have seen many people buying or spinning handspun sock yarn. I have always been curious to know how it differs from commercial yarns and while browsing etsy I stumbled upon this lil gem. Its 350yrds of handspun superwash sock yarn in a very pretty colour from knitting pretty who is a really lovely seller, very willing to answer my rookie questions so thank you for that! More pictures will be sure to follow once I cake this up and cast on, which I am pretty sure will be tonight! 18 lines is a lot! you should be proud of him for wanting to do it! 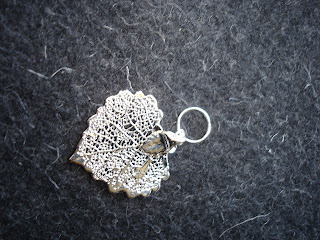 The leaf is stunning and tat handspun is gorgeous. Yay! You're blogging again! You were missed. Glad you're feeling a bit better. Good luck to the little wizzardling in his play, DD2 is a snowflake this year aaaahhh! No lines though she's got all on to remember the words of the new songs. Glad to hear you're feeling a bit better hun :-) take care you don't get run down again! sorry to hear you haven't been well. hope things in the middleearth household is happier now. That knitting pretty sock yarn is so beautiful!! !